We want to first thank you Dr. Snipes for allowing us to come together and tell your story. We do know that you have been under some malicious scrutiny, vicious personnel attacks and some slanderous accusations. Through it all we wanna know who sister Brenda Calhoun Snipes is and how is she weathering this storm. Dr. Brenda Calhoun Snipes has been a number of things in her well-lived and productive life. She is a loving wife and doting mother. She has been a committed educator and a deeply passionate mentor of teachers. Dr. Snipes is a highly skilled trainer and coach to teachers and students. She has been and remains a passionate leader of her people; she is an award-winning administrator and a reluctant but capable politician. In everything she has done, wherever she has been called, Dr. Snipes has left a legacy of meritorious distinction. Our community has been the greatest beneficiary of her dedication. Not one to brag or boast, Dr. Snipes has had jobs to come to her without having gone out of the way to get them. Dr. Snipes represents that generation of Black people, in particular Black women, who were determined to be the very best of whatever they involved themselves in. Their goal was not to attempt anything but to conquer everything. Theirs is the generation that knocked down the walls of exclusion by demonstrating their undeniable capabilities. They did not complain about the way things were- they pushed boundaries by their relentless achievement. Theirs was a pursuit of a quiet recognition. One that not even their enemies recognized. They were hidden figures and leaders in every way. We wanted to see our Black elected officials come out and support other Black elected officials when they were ENGAGED in conflict. Who was there to support you? We didn’t see the kind of support that we saw out front for other elected and appointed officials and it bothered us. When we would engage ourselves with the protesters outside of your office, we only saw three. Did this bother you that there were only three Black elected official who came out and showed support for you? Dr. Brenda Snipes is indeed a leader. I read that leaders are those whose actions inspire others to dream more, learn more, do more and become more. Indeed. Dr. Snipes has all of these character attributes. She demonstrates them daily. We know that she is task- oriented and her work says so, but we wanted to see others come out and stand with her to claim her competency and her integrity and give her the same respect, earned after over 30 years of service to our communities just as they did for others. She earned that! We are both impressed and encouraged by her. After sitting down with her in a protracted conversation, it became clear to us that being Supervisor of Elections is so much more complex and so much more demanding than most of us even dream. It is a job that is demanding, time sensitive and thankless. It requires a skill set most of us will never have. All the while under continuous and often unfair scrutiny. Even so, Dr. Snipes has made the Broward County Supervisor of Elections an award-winning organization. And she did it with no recognition by most of us and certainly no laurels from the immediate past and the now sitting Governor of Florida. In what appears to be an attack on our Black leaders and those who oppose a certain ideology, what are your sentiments on that? Arnold H. Glasow once said that “a good leader takes more than her share of the blame, a little less than her share of the credit.” Dr. Snipes is that kind of leader. We will miss her leadership and her presence as will the Broward County Office of Elections. This is Black History Month. It is supposed to be a month of acknowledgment of our history’s greatest achievers. I believe we need to recognize and appreciate those among us who deserve and have earned such distinction. Not only because of what they have done, but because of how well they have done it. We should do so why they are still alive. 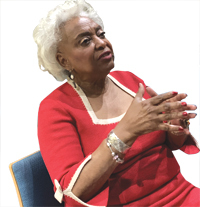 Our community owes Dr. Brenda Snipes so much more that we can ever repay her. But acknowledging her greatness is a beginning. If Brenda Calhoun Snipes could stand before an audience and tell us about this horribly unfair situation, what would you say to us?